Xining’s newly renovated Caojiabao airport is about 25km east of the city near Ping’an county town. You can get a taxi there for 100 RMB or take the bus (21 RMB) from the Bayi Lu bus station (corner of Bayi Lu and Huangzhong Lu). Air services include most major Chinese cities, as well as small, remote airports in Qinghai (i.e. Yushu, Golmud). While immensely unhelpful for seeing much of Qinghai, train is a great way to get into/out of the province. Until 2014, there was only one line: the famous Qinghai-Tibet Railway connecting Lanzhou with Lhasa. However, as of December 2014, the new high-speed Lanzhou-Xinjiang railway links Lanzhou with Xinjiang via Xining. Instead of passing north through the Hexi corridor like previous routes, this railroad climbs to 3800m in the Qilian mountains, making it the highest elevation high-speed railway in the world. Conveniently, the newly constructed bus station – a model of order and efficiency – is right next to the train station. The bus station is also the terminus for all local buses to the train station, making everything quite convenient! Along the Lhasa line, there are really only two destinations reachable by train: Golmud (the main city of Haixi prefecture, 12hrs) and, of course, Lhasa (22-24hrs). In the future, this may change, with rail being laid to Shigatse in the TAR and a potential new link from Golmud to Korla providing backdoor service into Xinjiang. The new Xinjiang high speed line opens up rapid service to Urumqi (10 hours) and all points between: Zhangye, Jiayuguan, Dunhuang, Hami, and Turpan. Expect to pay a fair bit of cash for these tickets. From the east, Xining has services to most major Chinese cities, including Beijing (20+ hours), Shanghai (30ish hours), Chengdu (24 hours), and more. Note that there are currently no direct trains from Xining to Xinjiang – you’ll have to head to Lanzhou or another Gansu destination first, and then change. Xining’s new bus station, which opened in January 2015 next to the new train station, is a model of efficiency. We’ll see how long that lasts. Buses also leave from no fewer than four separate bus stations scattered widely across town: Bayi Lu Bus Station (八一路汽车站 Bayi Lu Qichezhan, corner of Bayi Lu and Huangzhong Lu), Nanchuan Xilu Bus Station （南川西路客运站 Nanchuan Xilu Keyunzhan, Nanchuan Xilu just south of Liuyi Qiao), Xinning Lu Bus Station (新宁路客运站 Xinning Lu Keyunzhan, Xinning Lu btw. Wusi Dajie and Shengli Lu), and Xining West Bus Station (西宁西站客运站 Xining Xizhan Keyunzhan, immediately west of the Xining West train station). Hor (Herixiang) 和日乡and Ningxiu 宁秀乡townships in western Zeku county 4.5h to the Sancha Lukou 三岔路口 (intersection of roads to Golog, Tongde, and Ningxiu), 4h45m to Ningxiu, 5h+ to Hor: Every 2 days, departs 10am on odd-numbered days. Returns on even-numbered days, departing Hor at 7:30am. Dawu 大武 (Machen 玛沁) 7-12hr: 2 fast ‘business express’ buses during day, sleeper buses depart every half hour from 4:30 – 7:30pm. Darlag 达日(Dari): 18hr, sit night bus dept. late afternoon. Painful. Jigdril 久治 (Jiuzhi) 22+ hr: one bus every two days. Not a sleeper. Yushu 玉树 (Jyekundo): 13-18hr, sleeper buses dept. half-hourly 4pm-7pm; sit buses hourly all day. Tianzhu 天祝 Inquire at the bus station – I have no idea. Though at times creaky, with buses breaking down randomly in the middle of crowded streets, the Xining bus system is an excellent way to get around, especially if you’re not in a hurry. Services are comprehensive (to the point that you usually can choose multiple lines from any given stop), frequent, and cheap (1 kuai per ride, or 7 mao if you have a transport card). They are not, however, very fast, with Xining’s increasingly bad traffic and closely-spaced bus stops (often no more than 150 meters apart) making for a sometimes interminable ride. There is, however, an exception: the red Chengtong express buses, which are like a BRT (bus rapid transit) system except that they don’t have dedicated lanes. These buses are (GASP!) 2 kuai per ride (or 1.5 kuai with a transport card). And really: they don’t break down much anymore; most of the fleet was replaced in 2011-2012 (though you’ll still find yourself on the occasional blue clunker, most notably on routes numbered 80 and above). Another great advantage of the Xining bus system is that it extends throughout Xining City Prefecture – i.e., not simply Xining proper, but also all of Huangzhong, Datong, and Huangyuan counties. This means that there is shockingly cheap (if occasionally slow) bus transport throughout the region, all linked conveniently to the city network. What does this mean for you, in practice? You want to go to the Kumbum monastery (Ta’er Si). You pick up the direct bus from Guanli Zhan station 管理站 (on the south side of Kunlun Lu, immediately south of Ximen and north of the Nanshan temple) for 3 yuan. You arrive templeside 45 minutes later. You visit the temple, and then decide that you want to go on a hike. You hike into the hills behind the temple, through fields of eye-poppingly brilliant rapeseed flowers, over hill and dale and finally to a small village seemingly in the middle of nowhere. Suddenly, a small minibus comes into the village. You hop aboard, and it transports you back to the southern outskirts of Xining (another 3 kuai) – from which you can take a regular public bus back into downtown. Or, if this all sounds too planned, you can hop aboard a bus headed for a random-sounding rural destination (Lijiashan?) and head out to explore beautiful countryside. Ultimately, with this urban-rural bus system extending throughout the region, the world (or at least Xining) is your oyster. One last awesome thing about these buses: they all have MAPS of the bus route on board! This brilliant maneuver should be imitated by transportation systems worldwide, especially in Beijing, where a ridiculously labyrinthine system awaits the poor traveler like a dropped plate of the city’s famed 炸酱面 (fried sauce noodles). 2: All the way through the city from E-W: Sheng Guangdian Ju 省广电局 (near Shida in the west) to Tuanjie Qiao 团结桥 (in deep East Xining), passing through downtown. 1: From northern Xining (near the medicine museum) through downtown and to the east. 82: From Shida 师大 to Nanshan Lu 南山路 via Da Shizi/Ximen downtown, as well as Guojicun Gongyu (the Lete Hostel). Continues onward to eastern Xining. 83: From Haiyan Lu to Shengli Lu to Qiyi Lu, this takes a direct line across the northern streets of Xining from east to west. Relatively fast. 30: A comparatively fast bus (not at rush hour!) that runs along southern arterial Kunlun Lu. 11, 15: Goes the distance to Qinghai University in the far northern suburbs. 24: Painfully slow, but seems to go everywhere. Taxis in Xining start at 6 kuai and then proceed to go up after 2km (or time spent waiting). It can be difficult to get taxis in some areas, or when it is raining, or cold, etc. However, after the buses stop at 9-10 in the evening (some lines earlier), this is really the only way to get around. That new train station and bus station in Xining is holding up quite well. 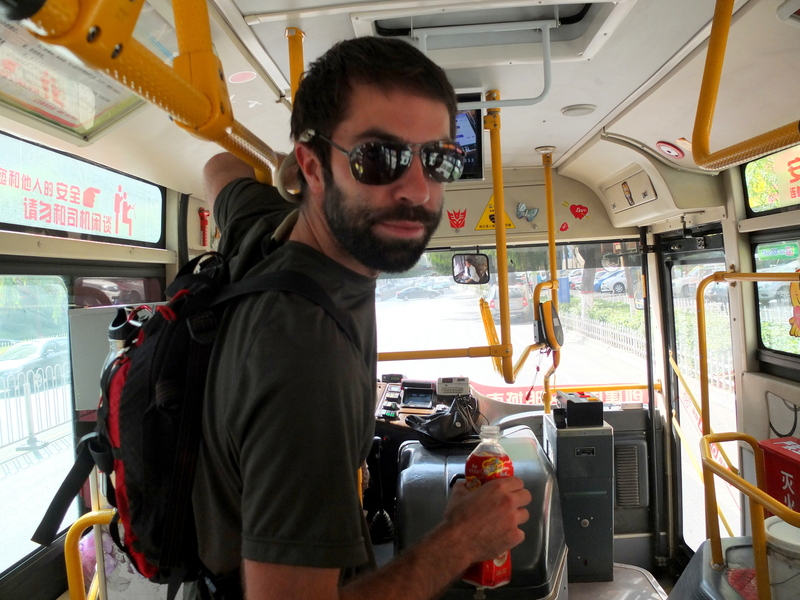 Took a train from Beijing to Xining and had a 2-hour window to buy a bus ticket to Yushu. Place was clean, well organized, and a helpful security monitor took me upstairs from the train to the huge plaza and pointed out the separate bus station. EZ to choose an overnight regular bus or sleeper. Returning from Yushu, I had to pick up a prepaid train ticket to Lhasa. Easy-Peasy at the pre-paid ticket counters on a busy Sunday morning. So, yeah, the modern Xining Train-bus complex is efficient and clean. Also, several musicans were playing in the plaza that morning. Good updates! Thanks! I’m behind on updating this page…as you can probably tell!